How long has it been since you cleaned your washing machine? Soap and hard-water deposits can build up on the basin of your machine, which will prevent your laundry from getting as clean as it can be. 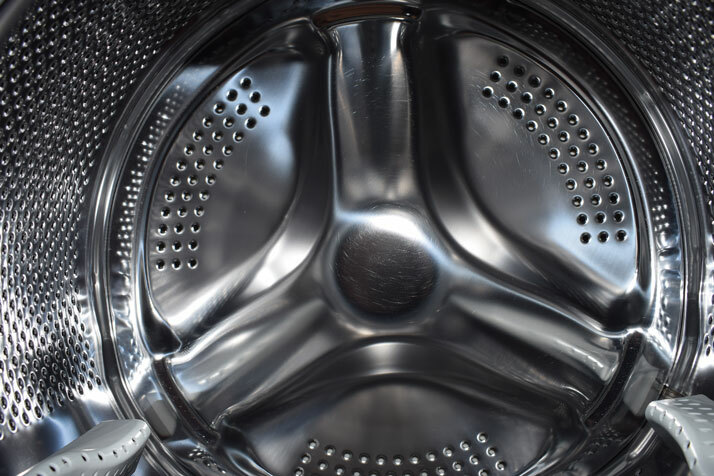 If you tend to wash larger loads, the rinse cycle may not be able to properly remove the residues from the sides of the basin during the wash.
Start your wash-cycle. Start a large hot-water cycle in your front-loading washing machine. Add one quart of household bleach to the water and allow the machine to do all the work! Stop the cycle. Give the hot water and bleach a chance to work by stopping the washer after a minute or two into the wash cycle. Allow the water and bleach to sit for an hour or so before resuming the wash cycle. Repeat with white vinegar. After the cycle is complete and the basin is empty, repeat this process all over again using a quart of white vinegar to the cycle instead of bleach this time. Do not mix the bleach and vinegar together to save time; this can create toxic fumes. If you own a top-loading or high-efficiency machine, follow manufacturer's recommendations for the best approach to cleaning your basin. The results will not only make your washing machine basin sparkling clean, but will give the entire home a freshly-cleaned scent and prevent hard-water deposits that can discolor your clothes in the wash!